When it comes to owning property in Ottawa, location can mean all the difference between foot traffic and passers-by. In a commercial environment, playing to your strengths is the key to success, so why not make the most of your views! Windows might not speak but they can say a lot! Make sure that your home or business is singing your praises instead of crying for help. 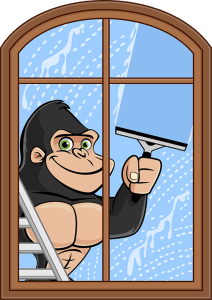 Your Ottawa window cleaning is an important part of your property maintenance and our Gorillas can do it right! In theory, everyone knows how to wipe a window. The chore itself is as simple as wiping dirt from a pane of glass, but getting results is a bit more difficult. Approaching your window washing with the wrong tools or technique only serves to swap one stain for another. You might clear away splash marks, or bird droppings but it won’t be long until they collect dust and dirt. As much as you might try, you just can’t keep these materials away. It’s not your fault though – it is just basic science! Standard cleaning products, partnered with rags or paper towels is the most common way to deal with marked windows. Unfortunately, the friction adds up as you wipe surfaces. This creates a static charge that pulls airborne material inward. No one wants to finish cleaning only to look back at more dirt! That is why our Gorillas come prepared to ditch that dirt and keep it gone. Our particular brand of services leaves windows cleaner, longer than our competitors. Keeping homes looking their best is always a priority for property owners but the pressure is even higher for business owners. The exterior area of your office or commercial space is the impression that it gives to both established and potential clients. In competitive industries, a messy look can mean the difference between passersby and hitting your budget. If you are looking to create clearer pictures around your workspace, a Gorilla can help! An experienced interior and exterior window cleaning service lets the light in for clients, while reducing energy costs for owners. Results are a top priority for any service but when it comes to local businesses, safety will always come first. In any workplace, there is always the question of liability. Sending an employee to scrub windows is a bigger risk than you might think. There are plenty of buildings that don’t extend beyond a single storey but the majority of office buildings do. Attempting to reach these higher spaces without the right safety equipment, opens the door for bodily harm, property damage and complications with workers comp. Avoid the risk of any of these by enlisting a professional service. In the case of safety, the right tools make a world of difference. Water-fed poles, for example, are used to reach glass, frames and sills up to four storeys high. These, combined with a mobile water source, allows our specialists to reach higher fixtures from the safety of the ground. For any issues that do encourage our Gorillas to climb, proper stand-offs and equipment are provided to keep experts on their feet. 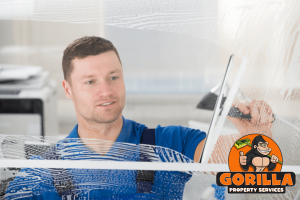 Instead of using traditional household cleaners or soapy water, our Gorilla technicians use eco-friendly cleansing agents across surfaces. The corners of windows have always been a haven for dirt and dust to hide out, but not with our speciality tools. Rubber squeegees and water-fed poles are used to clean every nook and cranny of your window panes. The surface of your glass might be the primary focus of your residential window cleaning services but frames and sills are important as well.